Roland TR-808 drum machine from inside front cover of Contemporary Keyboard magazine May 1981. 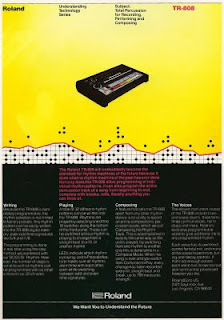 I personally liked this phase of Roland advertising - bright yellow, black background, and smaller, bright fonts. It follows the same theme as the Jupiter-8 ads I've posted that were coming out in 1981 and 1982. I think its also interesting that they chose to use such a small image of the drum machine itself. But the most interesting design elements are the black dots in a grid pattern - no doubt reflecting on the single row of 16 LED edit buttons available on the TR-808. But could it have also been hinting at the multiple rows of LCD dots to appear in later drum machines such as the TR-707, TR-505, etc? The ad copy also predicts the TR-808's future as the standard in drum machines to come (and indeed it did with many types of electronic music). Due to its current popularity, there is a lot of online information readily available including manuals and samples, so I've decided to just post a few links and let you run off on your own to find out more. Google has everything... so, have fun surfing!